This very handsome, Italian Renaissance-palazzo-style building is distinguished by some very attractive Venetian-style decorative balconies. It was erected in 1915 and converted to a cooperative in 1988. It has 55 apartments. The light beige-brick, 12-story building has a canopied entrance, flanked by paired pilasters, with bronze doors. The building's address is incised above the entrance as are the letters "J" and "P." The building, which has a cornice and several bandcourses, has a concierge but no garage. The building's facade has protruding air-conditioners and consistent fenestration. This is an attractive and quiet stretch of West End Avenue and is convenient to public transportation and one block from Riverside Park. Neighborhood shopping is convenient and steadily improving as high-end retailers continue to advance up Broadway. Marketing for the residential condominium conversion of the 13-story apartment building at 905 West End Avenue on the northwest corner at 104th Street began in 2008. 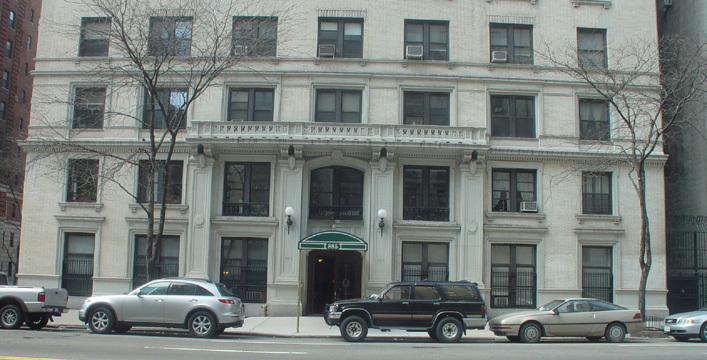 It was one of three similar buildings designed by Gaetano Ajello for the Paterno Brothers in this attractive stretch of the Upper West Side. The other two at 895 and 905 West End Avenue. In a June 24, 2007 article in The New York Times, Christopher Gray noted that the "three apartment houses on the same side were built by the Paterno family, all designed with a bold elegance by their favored architect, Gaetano Ajello, who left his name in each cornerstone. But these near triplets have aged quite differently. The northernmost, 905, has a desolate, blighted look, especially over the entrance, where leaks from high up have come out through the brick, leaving behind great whitish salt stains called efflorescence. The cornice has been ripped off, the brick patching at the edges is a sad mismatch, and a crude line of electrical conduit runs from the original grand lamp bases to smaller fixtures set about six feet too low. By comparison, 895 West End Avenue, across 104th Street, has had all the luck. Its windows are original; their wooden frames have a texture that even expensive metal replacements cannot approach. In the 1990s, the firm of Walter B. Melvin Architects replaced a missing cornice with an estimable reinterpretation, using off-the-shelf brackets, but to good effect. Best of all, the first two stories are in limestone in big rusticated blocks - it's sort of a mini-University Club - and the stone is blessedly unpainted. Bring a loupe, or even just a good pair of eyes, and peer up close at the ancient shells and other sea creatures from millions of years ago. There is a particularly scary spiderlike specimen below the second window to the left of the main entrance, and the whorls and patterns even run through the building's cornerstone. This part of West End has many good stretches of marine sediment turned to rock. The last of the three Ajello-Paterno projects, No. 885, has a fancy canopy and far too fancy replacement doors, but no one has stripped the stone of its paint. Who knows what delights hide under it?" 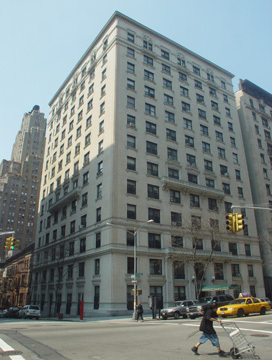 Ajello's other buildings in Manhattan include 473, 505, 514, 575, 645 and 884 West End Avenue, and 160 and 373 Riverside Drive ad the Alameda and Avonova apartments on the Upper West Side.